Young amputee Rio Woolf jumps into a swimming pool for the very first time after being fitted with a water activity limb from Dorset Orthopaedic. 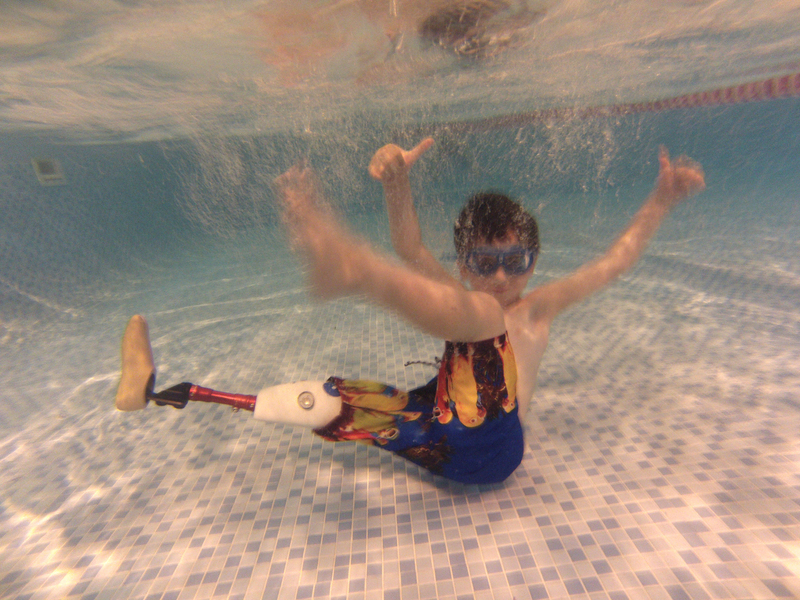 Rio Woolf, aged 6, has been making quite a splash recently as he has been fitted with his first water activity limb. Wasting no time, Rio put his fully submersible, waterproof leg to the test by jumping into a pool for the very first time, swimming, kicking and splashing, and independently getting in and out of the swimming pool. Rio was born without a shinbone, knee or ankle joint (a one-in-a-million condition called Tibial Aplasia), which necessitated his lower right leg being amputated through the knee when he was just 14 months old. Sporty Rio can already swim confidently at level 3 without a prosthesis as he regularly attends swimming lessons. However, Rio missed the freedom other kids his age have jumping in and climbing out of the pool unaided. Dorset Orthopaedic specialise in meeting the needs of young clients. They regularly fit children, providing them with adaptable and flexible care and ultimately the solutions to help them grow up living their lives without limits.